The stem wall on a concrete foundation is essentially the supporting wall that joins the foundation of a building to the vertical walls of the structure that is constructed atop the foundation. The stem wall transmits the load of the structure to the footing, which distributes the structure weight over a wider area. Stem walls are especially important in areas prone to earthquakes, flooding and other events. Stem wall construction requirements vary between municipalities and counties. The stem wall joins a building foundation to vertical walls. The footing is attached to the stem wall, which generally meets a vapor retarder at grade, then extends at least 18 inches above ground to be topped with a termite shield, sill plate, treated band joist and floor joists. The bottom of the footing below a stem wall is placed below the frost line. A "two-pour" foundation is named for the separate pours for the footing and the walls. 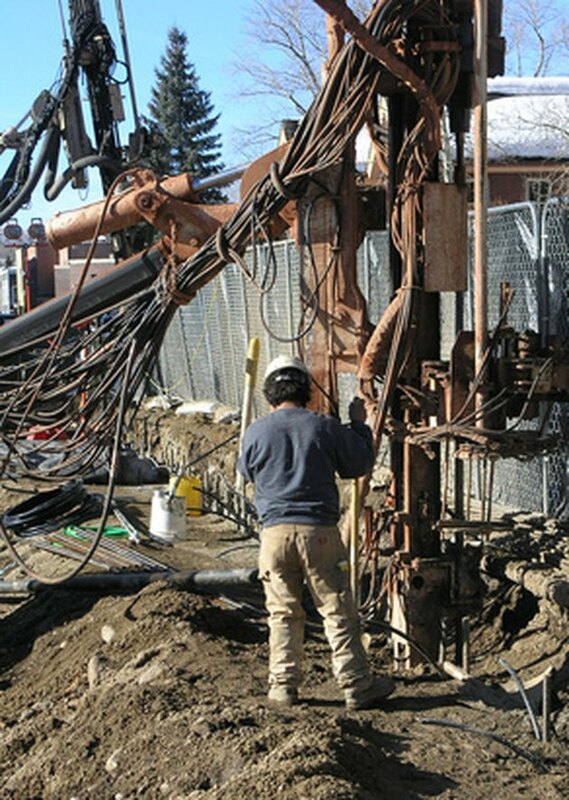 Vertical bars, or dowels, are used to connect the two; the dowels are hooked at the bottom into the footing and extend at least 14 inches into the stem wall, which is necessary in earthquake-prone areas. Without the dowels, the stem wall could slide off the footing during an earthquake event. A monotlithic slab foundation, also known as a slab-on-grade foundation, combines the footing, stem wall and a concrete slab subfloor in a single pour. This type of foundation has special requirements for horizontal and vertical dowels or bars. The slab subfloor must be several inches thick. A major consideration pertaining to stem wall construction is moisture control. Care should be taken to prevent water from seeping into the wall. An external French drain around the perimeter will help limit moisture. Foundation sealers can also benefit foundations; traditional petroleum-based sealers and nontoxic foundation sealers are both commercially available. The footing width minimum requirements depend on the load-bearing value of the soil and the weight of the structure. Especially poor soils may prohibit the use of a traditional concrete or masonry stem wall. The other most common type of foundation used with a raised floor system is the pier-and-bean foundation. Pier foundations are generally built of brick or concrete block supported by individual reinforced concrete footings or continuous spread footings. The pier spacing is influenced in part by the floor framing plants. The piers are covered with a termite shield and then topped by the sill beam and floor joints.